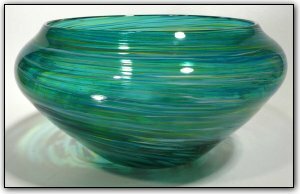 This uniquely shaped low bowl features the merging of yellows and blues into an enchanting translucent green, with some remaining yellow and blue highlights swirling throughout. Make sure to zoom in to see the intricate nature of the highlights, and how they compliment the unique shape of this low bowl. Such a beautiful and lovely bowl!